Teens and kids with braces have a love-hate relationship with Halloween. The abundance of sweets is a dream come true, but candy restrictions are not so wonderful. Protecting your teeth from too much sugar is important whether you wear braces or not, but it’s especially critical to tread carefully where Halloween candy is concerned when your child has braces (or you!). Some candies have more sugar than others, but most sweet treats cling to teeth and don’t let go. Hard candy: If a candy is hard enough to break a tooth, it can certainly break your braces. You can break your brackets, bend wires, and stain elastics with even the smallest piece of hard candy. Lollipops with gum inside are a double whammy of disaster for braces-wearers. And don’t even think about gnawing on a jawbreaker. Chewy candy: Whether fruit chews, chocolate chews, licorice, taffy, gummy worms, caramel, or gumdrops, these sweet, sticky treats can pull at your braces and bend, break, and even tear off the hardware. Chewy candy gets stuck in teeth easily and, since teeth that are covered with braces are difficult to clean anyway, there is a good chance you’ll be on cavity road if you aren’t meticulous about getting in every nook and cranny with every cleaning. Candy apples: Eating a candy apple is a commitment for anyone, even if you have healthy, braces-free teeth. Add wires and brackets to the equation and you can guarantee that the hard candy coating or caramel cover will wreak havoc on your hardware and teeth. All Halloween candy is not created equal, and all candy isn’t bad. There is one type of sweet that even braces-wearers can sit back and enjoy on Halloween and any other day: chocolate. When it comes to candy, chocolate is the kindest to braces-wearers. Skip the chocolate treats that contain nuts and caramel and stick to pure chocolate and you are almost guaranteed not to damage your braces. Chocolate is also less likely to cause tooth decay because it doesn’t hang around on your teeth for very long like the sugary, sticky sweets. It’s still important to clean your braces and teeth well, but chocolate is not the dental kryptonite that other candies are. 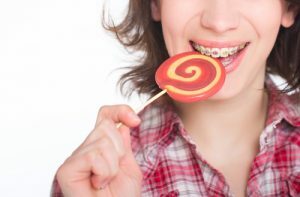 These candy recommendations are for any braces wearer, teen or adult. Only Invisalign-wearers avoid any Halloween candy restrictions. Patients who wear the nearly invisible aligners can remove them to indulge in any candy, anytime, without worrying about the condition of their braces. It’s still important to brush and floss afterward though – you don’t want sugar and bacteria getting trapped in that snug environment between aligner and tooth enamel. Make this a very happy Halloween – avoid the bad candies and you will avoid an orthodontic emergency. If you have questions about what to eat when you wear braces, or any other orthodontic questions, make an appointment with Dr. Roberts or Dr. de Marsche at our Center City, Philadelphia or Lawrenceville, NJ, office. Do I Really Need to Wear a Retainer After Braces?